Stop at Cabañas Mataveri to discover the wonders of Isla de Pascua. Offering a variety of facilities and services, the hotel provides all you need for a good night's sleep. 24-hour front desk, room service, airport transfer, meeting facilities, babysitting are there for guest's enjoyment. Each guestroom is elegantly furnished and equipped with handy amenities. Enjoy the hotel's recreational facilities, including diving, fishing, horse riding, garden, water sports (non-motorized), before retiring to your room for a well-deserved rest. 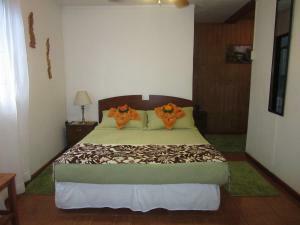 Friendly staff, great facilities and close proximity to all that Isla de Pascua has to offer are three great reasons you should stay at Cabañas Mataveri. One of the community users reported us that the Cabañas Mataveri in Isla de Pascua is a diver friendly hotel.